Affordable Trigger Time – at Home? The long-lasting ammunition crunch shows signs of easing, but commercial ammunition still isn’t nearly as available or as affordable as it was a couple of years ago. And reloading components, especially primers, are still scarce and considerably more expensive than they were. It is probably safe to assume that anyone reading this article (indeed, this “E-zine” site in general) likes to shoot and would like to be able to shoot more and pay less. It isn’t easy … especially if, like most 1911s, your pistols use .45 Automatic ammunition. If you happen to have a 1911 chambered for 9mm Parabellum you can reduce the cost of ammunition somewhat compared to .45 Auto … but only if you can find 9mm ammunition. Gasoline prices are on the rise, too, as this article is being written. A fortunate few readers may be blessed to have a range close to home, or even be able to step out the back door and shoot on their own property. The rest of us, though, probably have to travel to get to a shooting range. In my case, the range where I shoot is about 25 miles from home, and the drive across the city to get there takes 45 minutes to an hour, depending on traffic. The envy factor when I hear from friends who can shoot on their own land is considerable. I would be ecstatic if I could shoot on my little plot of terra firma, but I live in a suburb and neighboring houses are much too close to be able to shoot on my lot … safely or legally. I have tried airsoft, but there’s just something about airsoft that doesn’t feel like I’m really shooting. Part of it is that the pistols I have tried are plastic, but I know that for more money there are all-metal airsoft pistols available. Being a Scot, though, the notion of paying almost as much for a “toy” that shoots plastic pellets as I can buy an entry-level 1911 for just doesn’t have much appeal. At the 2009 SHOT Show in Orlando I spent some time in the booth of Umarex USA. I was mostly looking at their then-new Colt Tactical Rimfire line of .22LR AR-15 carbines, but I also noticed that they had on display some very realistic-appearing, Colt-licensed CO2 1911s that fire good old-fashioned .177 caliber pellets (or BBs). But those, too, cost nearly as much as a real 1911, with MSRPs on the high side of $200. So this year we were pleased and somewhat surprised to see that Umarex has added a new CO2-powered BB pistol to their lineup, a model much more affordable than the ones we saw in 2009. 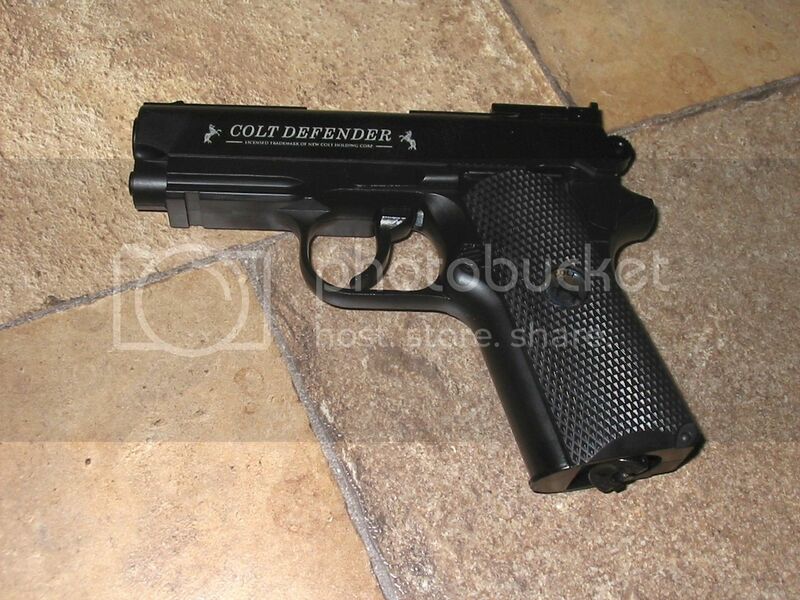 The new Colt/Umarex pistol is called the Defender. 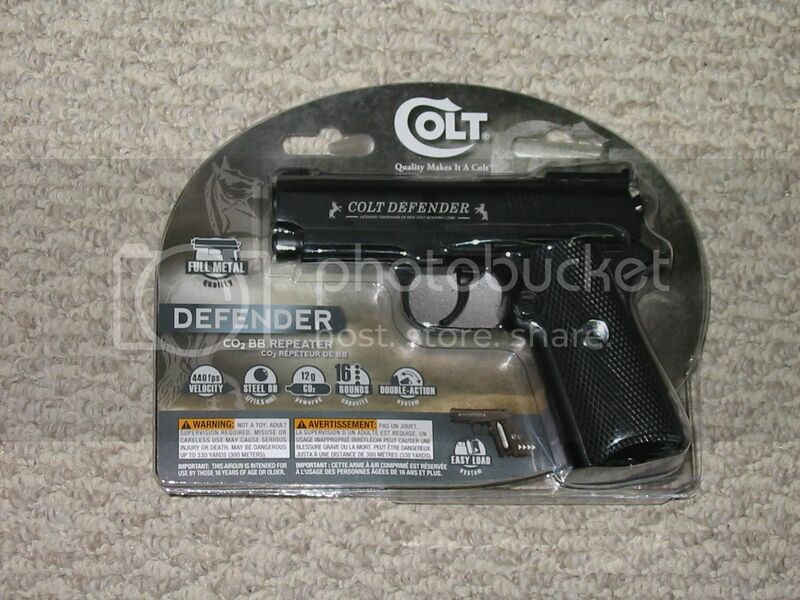 It is close in size to an actual Colt Defender pistol, but not quite. 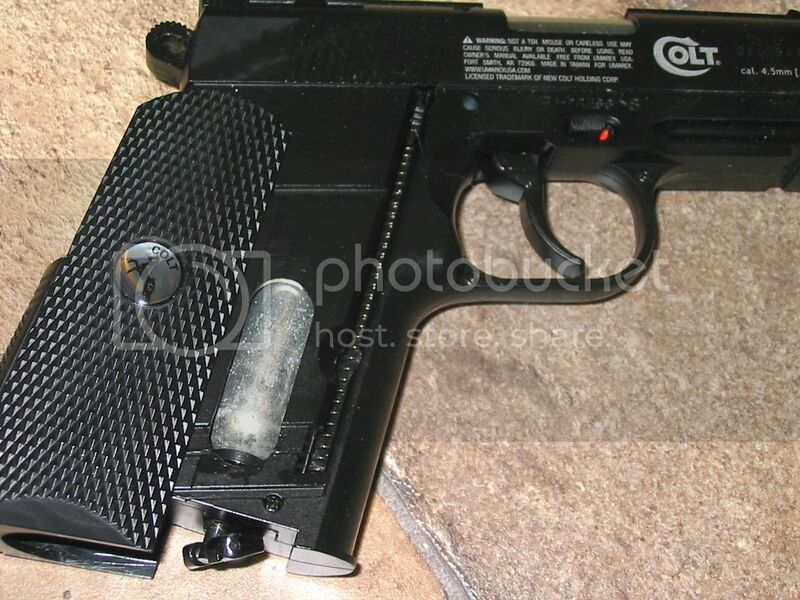 The real Defender has a 3” barrel, compared to a 3-1/2” barrel on a Colt Officers ACP. The Umarex Defender, measured from the rear of the “ejection port,” has a barrel length of about 3-3/8”. Longer than a real Defender, but not quite as long as an Officers ACP. The grip is very close to the same dimensions as a real Defender, so overall the Umarex Defender makes for a compact package. Another (major) difference from the real Defender pistol is that the Umarex Defender has a tactical light rail molded into the underside of the frame dustcover. This is great for anyone who wants to attach a tactical light and practice night shooting and/or night tactics, but it means the Umarex Defender won’t fit in most holsters made for 1911 pistols. The Umarex Defender can’t be used to practice drawing from concealment unless you spend extra money to buy a holster specifically made to fit a pistol with an integral light rail. Visually, the Umarex Defender looks very much like a 1911 from a short distance away. Unlike the better airsoft 1911s, though, this pistol does not function at all like a real 1911. The entire body (receiver) and slide are molded as a single unit out of an unidentified metal alloy. The molding is very high quality, with impeccable visual detail – lines are crisp and straight, checkering is sharp and well-defined – but none of the controls are real or functional. There is no grip safety. The thumb safety doesn’t move, the slide stop doesn’t move, even the hammer doesn’t move. The trigger is a top-swinging trigger, more like a revolver or Hi-Power trigger than a 1911. And there is no removable magazine. The only control that actually performs a function is the magazine release button. 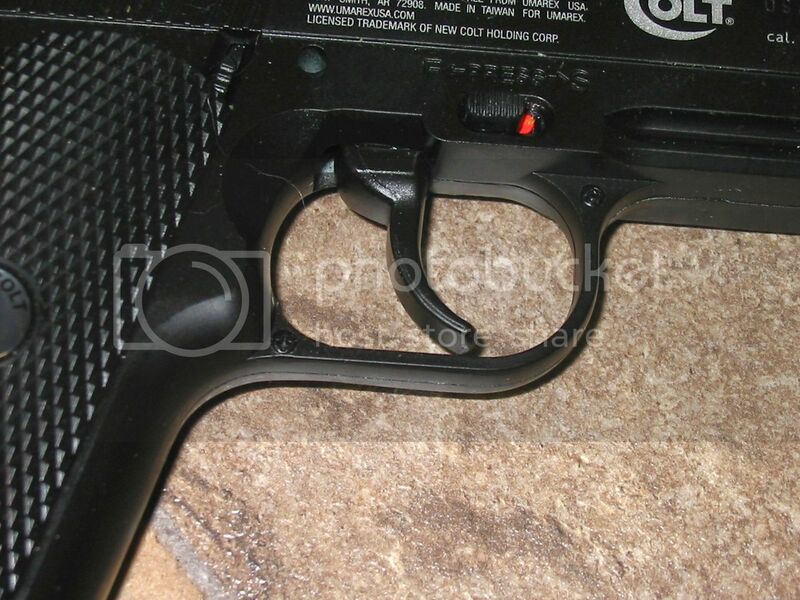 Pressing the magazine release on the left side of the pistol releases the grips, which slide rearward as a pair to expose the inside of the grip frame. On the left side is a window into which the CO2 cartridges are inserted. A thumbscrew on the bottom of the grip frame is then tightened to press the gas cartridge into place and puncture the seal. On the right side of the grip frame, sliding the grips back reveals the integral magazine. The follower is pushed down, BBs are dropped into the loading slot, and the follower is then released to push the BBs up into the feed position. Magazine capacity is 16 BBs. Unlike the real Colt Defender, the Umarex Defender has a flat, serrated rib extending the full length of the top of the slide. The rear sight is shaped like an adjustable target sight, but is actually molded as part of the overall body and has no adjustment. The barrel is a smooth bore tube, unlike the more expensive Umarex Government model, which has a rifled barrel. Advertised velocity using standard steel BBs is 440 feet-per-second. The Defender accepts only round BBs; it cannot fire pellets. The bottom line is, ultimately, trigger time. BBs and CO2 cartridges are inexpensive and readily available virtually everywhere. Wal-Mart always carries large stocks of both. It didn’t take us long after the pistol arrived to cut open the blister pack, remove, charge and load the pistol, and head down to the basement for some trigger time. Unlike our customary pistol reviews, we made no attempt to test the Umarex Defender with multiple types of ammunition. BBs are BBs, and CO2 is CO2. We set up a target against an improvised backstop about 20 feet away and started shooting. Initially, the trigger was … different. It doesn’t slide like a 1911 trigger, it swings like a revolver trigger. It is not as heavy as a double action revolver, it is heavier than a single action revolver, and the throw is considerably longer than a single action revolver. Our first attempts yielded 15-shot groups of about 2 inches, shot two-handed from a standing position with no rest from a distance of approximately 20 feet. As we expected, there is simply no recoil, and rapid fire is easy, fun … and downright addicting. The purpose of trigger time is to practice fundamentals, but the downside of using something like this pistol for practice is that the ammunition is SO affordable and the thing is so much fun to just blast away with that it’s entirely too easy to forget about form, sight picture and breathing and just blast away. Self-discipline finally reestablished itself, though, and we were able to reduce the size of our 15-shot groups to just about an inch. Again, that’s from a standing position, two-handed hold with no rest. It won’t win any bullseye matches, but for a smooth bore barrel and a pistol costing well under $100 we think those results are very satisfactory. 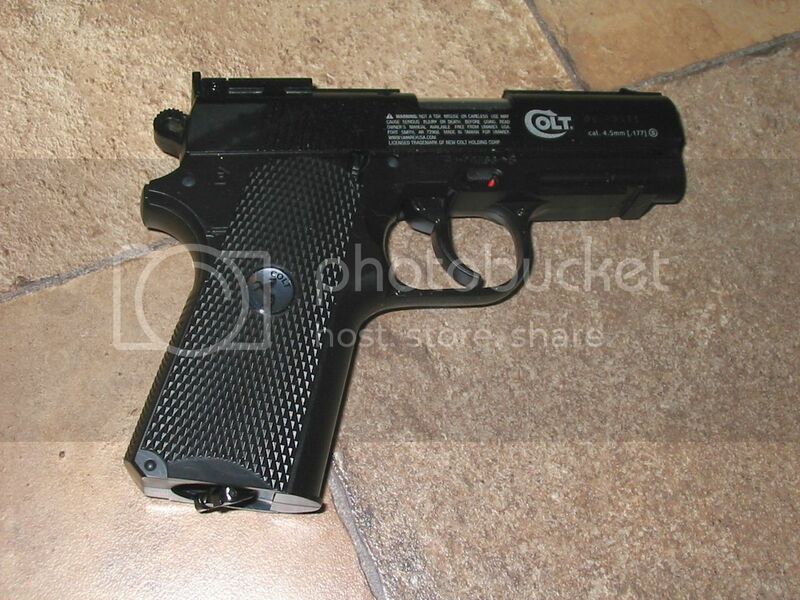 The fun thing is that this is a pistol that can be used in the privacy of your own home, anywhere you happen to live. Our improvised backstop was a sheet of plywood with three layers of corrugated cardboard in front of it. The hope was that the cardboard would alleviate the tendency of steel BBs to bounce off wood backstops. That was the hope … but it didn’t work. Some of the BBs were kept near the plywood, but as we were shooting we could hear BBs ricocheting around the basement. As with any “firearm,” wearing eye protection is essential when practicing even with a BB gun. For longer term use, we recommend either making a better backstop, or simply buying a bullet trap. Beeman offers one that’s rated for BBs and it is available at any Wal-Mart for under $20. One of those traps would be an excellent investment as an accessory with the Umarex Defender pistol. Despite the initial disappointments of no moving (control) parts and the swinging trigger, we found the Defender to be pure fun to shoot. On those cold, snowy winter days or evenings when the thought of venturing forth to a shooting range is totally beyond the pale, the Defender BB pistol is an almost perfect substitute. You can shoot all evening for just pennies, and not even disturb the neighbors. 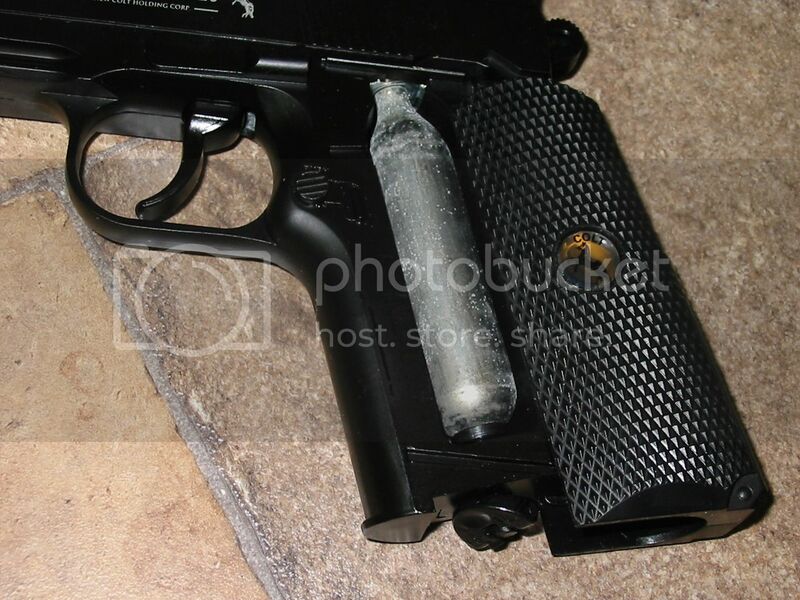 Although accuracy isn’t competition-grade, it is more than adequate to practice general plinking and self-defense techniques such as point shooting (with a suitable backstop, of course).